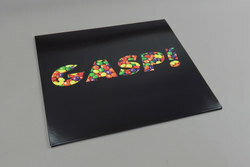 Zomby - GASP!. Vinyl EP. Bleep. 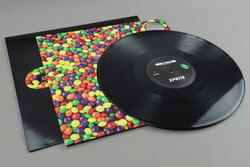 Zomby debuts on Big Dada with his first new music since the incredible Ultra LP on Hyperdub, a three track suite of chopped-out moody techno that is quite unlike anything he has turned his hand to before. GASP! finds the enigmatic producer moving his UK focused sound into more bass heavy techno waters, the title track's kicks portray a night-out spent pounding to a severe kickdrum grind while the hours are clawed away, flashes of strobe-lit memories filled with intensity beamed live and direct from the earliest of hours spent lost in a maze of 4x4 drums. While the breakbeats still fire strong through the industrial wasteland of ZPRITE, the mood throughout GASP! 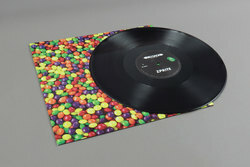 is one of a serious no-nonsense vibe, a shadow of industrial moodiness hangs heavy over the EP's proceedings that make the sugar-coated cover shot the perfect disguise for the dark 'n' deadly junglist sounds that lie in wait.